We see a massive variety of work while reviewing photo-eye submissions, I get a bit excited when something extra special comes in, which is how I felt when I first looked at the images in Kevin Erskine’s Supercell portfolio. The Photographer's Showcase jury was equally impressed -- Erskine's panoramic images capture the fierce overwhelming beauty of supercell thunderstorms in striking color. Recording these spectacular storms, the images are always framed with just enough of the earth visible to ground the viewer and -- when combined with the scale of the prints (and now the oversized book from Hatje Cantz) -- articulate the feeling of being dwarfed by the overwhelming force of nature. The images also come with a fantastic back-story -- a Nebraska farmer who took up chasing and photographing storms as a teenager. Except the man behind these breathtaking images isn't who he seems to be -- Kevin Erskine is only a good story, the fabrication of a celebrated Dutch photographer and filmmaker. Releasing this body of work under the name Kevin Erskine allowed him to leave his previous photographic existence behind and immerse himself in the world of storms. photo-eye: As a Dutch photographer who is well known for his portrait photography, shooting storms in the United States seems like a bit of a photographic departure. Where did the idea for this project come from and how did it develop? Kevin Erskine: My fascination with big storms started in my childhood during the winterstorms in Holland. During a trip in the US, I teamed up with renowned stormchaser Tim Marshall. From that moment on I was totally addicted and obsessed with the beauty of severe weather. PE: Using a pseudonym for this photography project is an unusual choice, but you didn't just use a different name, you developed a character. Why did you choose to do this? Did it alter the way you see the work? 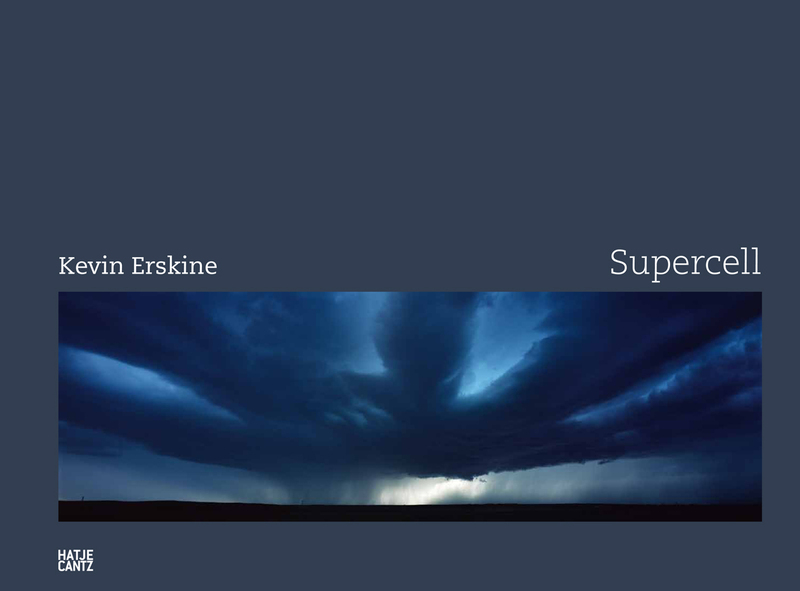 KE: Kevin Erskine is my way to escape the reality of everyday life and to fully concentrate on storms. 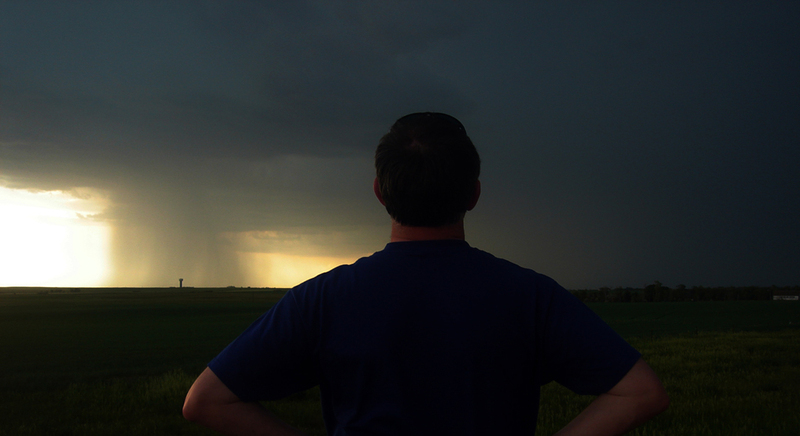 Stormchasing to me has always been a sort of psychological quest. A close - occasionally too close- encounter with the overwhelming energy of Mother Nature. As Richard Hamblyn puts it "To stand beneath a supercell structure that extends from one horizon to the other, and to watch as it begins to eerily rotate, is to realize that we live not at the top of the solid earth, but at the bottom of an unfathomable ocean of air." To really get in touch with these forces of nature I decided to step in the role of an American farmer. A loner, someone who almost lives weather. Someone who learned that the destructive powers also have beauty to it. PE: Your images would generally be classified as landscapes, but the focal point is very much the sky -- the land itself is often just a small strip at the bottom of the frame, grounding the viewer. What’s it like to be shooting images in the face of an oncoming storm? KE: The small strip of land gives reference to the magnitude of the storms. The storm dictates the position. To get ahead of the storm and be in the path of a coming Supercell gives you (mostly little) time to set up a tripod and do lightreadings. The closer the storm gets the more beautiful it often is. It's like a living and breathing beast. Ever changing its appearance in color and form. PE: What are the challenges of shooting something so huge that is constantly moving and changing? How do you find the storms you shoot? KE: The greatest risk is the lightning threat. Photographing Supercells puts you in the open field quite close to a rotating storm.You just can't predict where lightning strikes. For finding the storm and safely getting me out I rely on Roger Hill. He is a great expert. PE: You're shooting medium format in a tricky environment. Can you tell us about your technical set up? KE: I use a Linhoff 617 camera. It has the largest medium format possible (6.7 inch wide). Having only 4 images per roll makes me to concentrate on the right moment. Changing film in the storm is usually not an option. The result of the large film showing the rich tonality and colors of the storm makes it worth while. I prefer to keep the images pure and unaltered by computer manipulation. PE: Your book Supercell from Hatje Cantz is beautiful -- the colors are rich and the oversized format is optimal for displaying the panoramic images. Tell us about the process of putting the book together. Did you collaborate on the design? KE: Every image tells it's own story. We chose a classic design to give every image room to breathe. So my selection of around 100 images resulted in a 200 page book. I got to know the people of Hatje Cantz as dedicated craftsmen with a love for bookmaking. I am indebted to historian Richard Hamblyn for writing the introduction. Reading his award winning book The Invention of Clouds humbles me. PE: What's next for you? KE: The first large solo show in the U.S. is planned in March in New York. Kevin Erskine will continue to photograph the beauty of big weather.